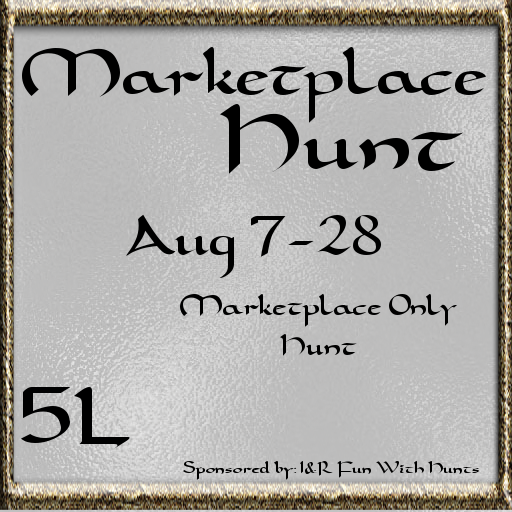 The Marketplace Hunt will take place Aug 7-28, 2016. Prizes will be 5L and should represent your store, in both type and quality. This hunt will take place entirely on Second Life Marketplace and no inworld store is required. There is no theme for this hunt so you can make anything. There will be no LMs or hints for this hunt. All URLs will be linked on the front page of the blog. The hunt order will be "first come, first served". * There is no restrictions to what type of gift you want to give, however , NO Resellers, (BIAB) Business In A Box, and/or Freebies found in BIAB. *Items must be on the marketplace and set to sell 48 hours before the event starts and URL notecard must be returned to us. *Gifts must be new or a recolor that has never before been released. The item will only be for sale as part of the hunt. When the hunt is over you are free to use it as you wish. * If you have to drop from the hunt please let someone know ASAP. * Hunt items come through a mailer so be on the watch for them. If you are offline it will wait to deliver it. * We will be checking all hunt applicant stores and reserve the right to refuse. Do not assume that if you’ve completed the application, it will be automatically accepted. *If you are accepted, your hunt sign must be rezzed immediately, in clear sight. It must stay up for the duration of the hunt. * Your prize must stay out for the duration of the hunt. * Please use our mailbox for all notecards, hints, etc. We often get capped and things do get eaten by SL. Also two of us do the hunts so this way we can both access the information. * Incomplete applications will not be accepted. If you have not heard anything within 72 hours please contact Isabelle Torok or Ripley Rozenberg as apps do sometimes get lost. Any questions feel free to IM Isabelle Torok or Ripley Rozenberg.